ADD A MEAL AT NEW SEASONS TO FEED A HUNGRY PERSON! 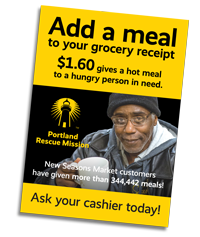 Next time you’re in line at one of our New Seasons partner grocery stores, tell your cashier you’d like to “add a meal” onto your grocery bill to help feed a hungry person through Portland Rescue Mission. Your $1.60 gift (or any amount you choose) will appear on your receipt. For less than the price of a loaf of bread, you can give hope to a hungry man, woman or child for one more day. Visit one of our participating stores today. More than 150,000 meals have been supplied by supportive shoppers!